Old Ottoman Tombstone. Eğidir. Photo by Bronwyn Mills. 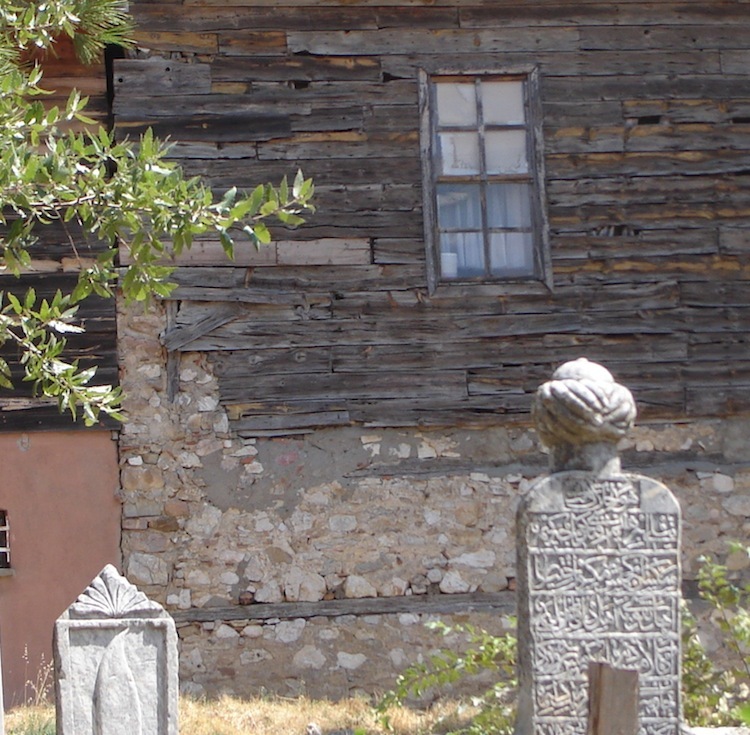 In my travels around Turkey, I was struck by the often disheveled appearance of old Turkish tombstones. They lie askew, often tilted, and—as in this photograph—often with a turban on top or some crowning decoration. Most people, when they see the kind of writing on these monuments, assume that it is Arabic. Wrong. The script as well as the pre-Republican people and their empire were referred to as “Ottoman.” Now, one must go to a special place to learn the old language. Ottoman does, indeed, have a number of Arabic and Farsi loan words; modern Turkish, however, has been purged of many of these, and uses Roman letters. The two languages and their orthographies now differ enough so that my Turkish students could not even read the tombstones of their grandparents, let alone their great-grandparents. How, then, does one write a novel when less than 100 years ago, the tradition behind you was of court poetry, some stiflingly precious and generally reflecting a highly gendered society? when its tradition was one which clung to Buyuk Baba, “Big Father,” (the patriarchy, I suppose), yet also fervently wished to be modern? when one cannot read the language in which it was written any more? I hope Kesal will forgive me, because he is clearly a very contemporary person, steeped in the culture of our times; but this is a long-standing question of mine. I tend to think that writing a novel, at least at the time when the Republic was being birthed by Ataturk, as an act of reinvention not simply invention. Like the theme of Kesal’s short piece—and I mean this most respectfully—writing the novel was a bit like the dilemma of renaming a child for officialdom. Most of the models for the construction of a novel were from the West, starting—at least—with Cervantes’ Don Quixote and, in the early 20th century, with the work of French writers. Excepting Yaşar Kemalwho wrote about the “mountain Turks” (often read as a euphemism for Kurds) and Moris Farhi in Britain, social realism and the political novel were not widely imitated, whereas the contemporary novel of bourgeois neurosis was and is the more popular model. I have been told that, in Ottoman days, it used to be an insult to call someone a Turk. Ataturk, dubbed the “Father of Modern Turkey,” turned that around in the interest of trying to create a sense of secular nationhood: “Blessed is he who calls himself a Turk,” he said, in just such a campaign. In 1926 he ordered a grand project to reform the language—to strip it of Arabic and Farsi loan words and to institute the Roman alphabet. The Turkish which was the yardstick for these changes was the language of Anatolia, the Asian and by far the largest part of the country. While some few whisper, disparagingly, that contemporary Turkish is a peasant’s tongue, that those who reformed the language on Ataturk’s behalf may have impoverished the language (“buyuk” means “big,” “buyuk” means “great,” etc. ), such complaints ignore the flexibility of the language. Turkish is agglutinative. One can improvise, like a jazz musician, add suffixes so that, to use a small example given me by a Turkish linguist friend, there is a single word for a-shave-that-is-so-slick-a-fly-would-slide-off-it. This works with fascinating results in contemporary Turkish poetry. Unfortunately, when one then adds Turkish syntax, so structured as to lay a thousand snares for the non-native speaker, translation becomes difficult. Further, Turkish is an Asian language at its base; and there go articles, gender, and a few other things if the translator is not careful. In short, the foreign reader is sometimes saddled with a rather awkward read. For example, my favorite Turkish novel, The Time Regulation Institute, an older book by Ahmet Hamdi Tanpınar, wonderfully satirizes the coming of an industrial society; but I had to slog through an unfortunately clumsy English translation to savor it. I have mentioned British Turk, Moris Farhi. Farhi writes in English, but I remember a conversation some time ago in which he and another Turkish friend wistfully recounted some of the plentiful folklore of Turkish oral culture. Up until the advent of radio, for starters, and television, for the coup de gras, professional story tellers would compete in days-long competitions in the kahve houses of Istanbul and throughout Anatolia. Sadly, these tellers of tales who had committed hundreds of these stories to memory, are now nearly extinct. The Simurg, a benevolent winged critter, others fantastical, stories of various Hocas (Muslim teachers), are now considered, I suppose, the stuff of children’s literature when in fact they may well be the source for the linked and the interlocking tale—and more. They certainly constituted rich fare for the adults of prior times. I do wonder why those tales and their techniques are not sourced more in modern Turkish novels, as Ngũgĩ wa Thiong’o found that he was compelled to do with his mother tongue’s Gikuyu orature when returning to that language to write his fiction. Kamau Brathwaite used to say that “to name someone is to love them.” He referred back to the custom, in some parts of Africa, of not naming a child until one was sure that one could love them, that it would live, as children without modern medical care sometimes did not. But I think Brathwaite meant something more. Ercan Kesal, in Fairy Soda, uses the idea of naming to point to the dissonance between modern, urbanized life and a more rural traditional existence. The anonymous child of this story is a girl and, while Turkey is a determinedly secular state, girls, especially in the eastern part of Turkey where our author situates his tale, girls are not always given equal personhood; and the majority of illiterates that persist are female. True, while there is something about the right to a name—and though we don’t name ourselves—worse is what it might mean if no one cared to do so. In my mind, that might also apply metaphorically to the largesse of Turkish orature. I shall say no more. The entire book, stories based on the author’s experiences as a doctor doing civil service in a more traditional, rural area of Turkey—ably translated by Mark Wyers—is scheduled to come out soon in English. We will keep you posted, Dear Reader. Sadly, this author, who in my opinion should have been considered for the Nobel awarded to Orhan Pamuk, died this year, February 28, at aged 91. Rumor has it that Tanpınar originally wrote it in Ottoman, but was such a firm believer in the Republic, that he rewrote his work in modern Turkish. Ngũgĩ means that rich and numerous collection of oral tales, techniques, performances which in every way except their manner of preservation (“in the head” rather than on the page) are equivalent to any other culture’s written literature. I use that term quite consciously. Turkey should never be confused with Muslim countries which have imposed sharia or those overrun by a fanatical minority foisting sharia upon them. Ercan Kesal, author, is a doctor, actor and writer. Born in Avanos, Turkey in 1959, and graduated from Ege University’s Faculty of Medicine in 1984 and went on to work at state hospitals, village clinics and in the private health sector, in which he has founded various clinics. In 2006 he received his graduate degree in the field of Applied Psychology, and he is currently working on a PhD in Social Anthropology. He acted in Nuri Bilge Ceylan’s film Uzak (Distant) and then co-wrote the script of Bir Zamanlar Anadolu (Once Upon a Time in Anatolia) together with Ebru and Nuri Bilge Ceylan; the script was nominated for “Best Script” at the Asia Pacific Screen Awards. Over the years, Kesal has won numerous awards for his acting and scriptwriting. He has published numerous essays and stories in Turkish magazines and newspapers; after the Turkish version of Peri Gazozu (Fairy Soda) (2013), he has followed in 2014 by Evvel Zaman (Times Bygone). The former will be out soon in English . Mark David Wyers, translator, grew up in Los Angeles, California and received his B.A. in Literature from the University of Tampa. He went on to complete his M.A. in the field of Turkish Studies. His book “Wicked” Istanbul: The Regulation of Prostitution in the Early Turkish Republic, a historical study of gender and the politics of urban space, was published in 2012, and a number of his Turkish to English translations of short stories have been published in collected works. He has translated numerous Turkish novels into English as well, including Selim İleri’s Boundless Solitude (2014), and his translations of Emrah Serbes’ Hotheads, Murat Menteş’s Ruhi Mücerret and Şebnem Burcuoğlu’s Spinster at Thirty are slated for publication in 2015/2016.